A couple weeks back brought the somewhat surprising news that Disney is planning to reboot its successful Pirates of the Caribbean franchise, this time without Johnny Depp. This move made sense given the franchise’s critical decline, diminishing domestic box office performance and the leading actor no longer enjoying the same public enthusiasm he once did. There are reasons to be excited about this reboot, but it got me thinking: why are Disney’s Pirates of the Caribbean movies the only movies about pirates Hollywood seems to be making? Pirate movies were more prevalent decades ago, but nowadays it’s pretty much just Pirates of the Caribbean. Disney’s five Pirates films have made over $4.5 billion worldwide and the company may own the brand Pirates of the Caribbean, but the Mouse House certainly doesn’t own the concept of pirates. Hollywood is a predictable beast in that success breeds imitation; the MCU’s popularity is why you see so many comic book and superhero movies coming to the big screen, and Game of Thrones‘ impact is why every streaming service is working on expensive high fantasy shows. So why not pirates? The rest of Hollywood is just letting Disney’s franchise monopolize the market, and I think they’re leaving galleons on the table because pirates can be the launching point for some exciting storytelling opportunities. 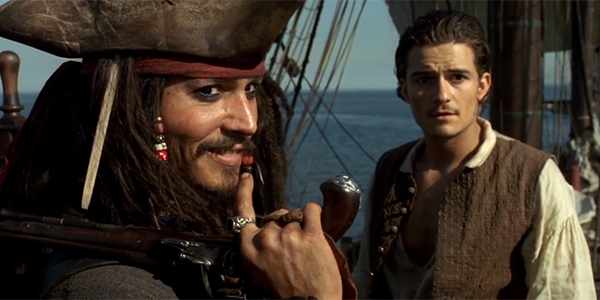 Here’s why Hollywood needs to make more movies about pirates. The Halloween holiday just passed, and if you went out to celebrate, it wouldn’t have been strange to see people dressed as pirates. Pirates are ingrained in pop culture as an idea, and that’s a powerful thing. Generations have grown up with pirate stories, from Sinbad and Treasure Island to Peter Pan and Pirates of the Caribbean. And there are few films that the ever-important millennial demographic has more of a nostalgic connection to than The Princess Bride and Hook. Although Disney’s Pirates of the Caribbean movies are set in a real historical period and occasionally feature real historical figures, they are decidedly fictional. That’s great for the film series, but there is also a lot of fascinating real history that took place that has never been given the proper modern big screen treatment. For example, it always fascinates me that there isn’t some great and gritty Blackbeard movie that chronicles the life of history’s most famous pirate. The Golden Age of Piracy from the 1650s to the 1720s alone has numerous events and figures worth exploring, from the Caribbean to the Indian Ocean and beyond. Figures like Madame Cheng, Captain Kidd, Henry Morgan and Long Ben all lived lives that could be adapted to the big screen. Starz’s Black Sails series also showed how what was ostensibly a Treasure Island prequel with characters like Billy Bones and Long John Silver could incorporate real historical figures like Anne Bonny, Calico Jack Rackham, Charles Vane and Edward Teach to great effect. Historical fiction like that is a great way for pirate movies to explore fascinating real-world history while still giving filmmakers plenty of leeway to tell original stories. Part of what is interesting about pirate stories is that audiences can accept them as realistic historical tales or adventures filled with fantasy. Probably the two most prevalent pirate stories in pop culture are Peter Pan and Disney’s Pirates of the Caribbean, both of which incorporate fun fantasy and supernatural elements in to their narratives. Cursed treasure, sirens, sea monsters, mermaids and all the other mythological elements that lend themselves to pirate movies give them more tools to play with to tell stories that exist outside the historical record. These elements make for bigger spectacles and the kinds of movies that make money at the box office. Pirate movies don’t even need to be set on the real Earth; buccaneers can be applied to all types of stories, as something like the anime One Piece shows. In Hollywood’s nostalgia-driven age, it’s surprising that an adaptation of the animated series The Pirates of Dark Water doesn’t seem to be in the works. The 1991 animated series, which is about alien pirates, fantastical creatures and mystical treasures on the world of Mer that is about to be consumed by a substance known as Dark Water, has franchise written all over it. The point is that pirate movies can be faithful recreations of history or weird fantasy stories and that flexibility gives storytellers a lot to play with. There are pirate movies as kid friendly as The Pirates Who Don’t Do Anything: A VeggieTales Movie and as mass market as Pirates of the Caribbean, to a movie that’s as hard-R as something like Black Sails was on TV. Think about a genre as vibrant as comic book movies and you’ll see something similar. Incredibles 2, Spider-Man: Homecoming, Logan and Deadpool all fall into the same genre, but they are all vastly different films tonally. That’s the sign of a healthy genre and I think that pirate movies, while not necessarily having quite that latitude, still have a ton of potential to do something similar. Comedy, drama, action, horror, sci-fi, fantasy, pirates work in all these contexts. Disney has had so much success with Pirates of the Caribbean series that after five movies, it has decided that it is going to keep this ship moving and Scrooge McDuck’s vault full by doing it all over again with a reboot. But Disney shouldn’t be the only one telling original pirate stories. The Mouse has only scratched the surface with its films and the rest of Hollywood needs to seek their own buried treasure and make more pirate movies.